This gorgeous top is a favourite due to its flattering drape styling. Made with eco friendly Rayon from bamboo. This brand works exclusively with natural fibres and, where possible, environmentally friendly alternatives that allow us to reduce our impact on the environment. Super soft to touch, you'll feel amazing in this. Discreet nursing access via pushing the drape to one side and lifting up the material covering the chest to reveal openings for feeding. Bamboo Rayon – made from the pulp of bamboo grass, is earth’s fastest growing plant, and is also a sustainable source of fibre. Its environmental benefits arise largely out of its ability to grow and spread quickly without the use of fertilizers and caustic pesticides that can contaminate and damage the environment. Bamboo rayon is a soft, breathable, super absorbent and lustrous fabric that is lightweight and has a cooling effect on the skin. 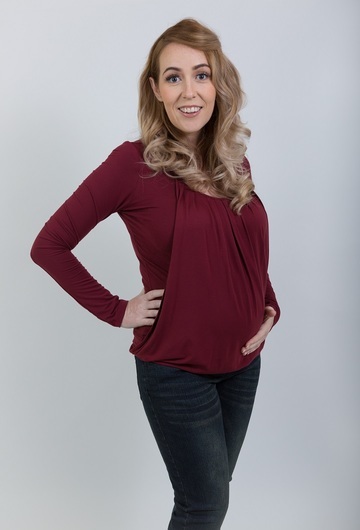 Whether it’s a maternity top or nursing dress, determine your size based on your current bust measurement. Measure around the fullest circumference of your bust and refer to sizes as per the above to get the best possible fit. If you are in-between sizes, we suggest choosing the next size up, particularly if you are in the early term of your pregnancy.